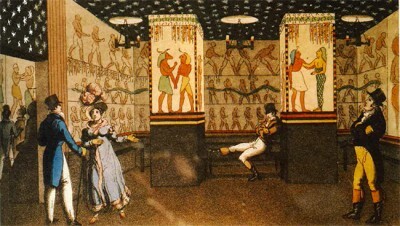 Since the Napoleonic occupation of the country in 1798, images of Egypt have played continuously on the European mind. A geopolitical hotspot, Egypt was central in 19th and 20th century reconceptualisations of time and speed, infrastructure and technology, aesthetics and movement, all negotiated through circulating imagery. This exhibition traces the history of moving images and objects within and out of Egypt, from the massive to the virtually weightless, concentrating on issues of design, media, architecture, art and travel. It follows images of Egypt – factual and fictitious – across media, space and time, from monuments to postcards, from opera scenes to film sets, from nineteenth-century surveys to the facsimiles being made of Egyptian tombs today. Inspired by the Description de l’Égypte, the twenty-volume record of the work of the more than 150 savants Napoleon brought to Egypt in 1798, published from 1809 through 1829 in mammoth folio (100 x 81 cm), Images of Egypt presents the research of graduate students. In text, images and films the projects negotiate the relationships between media and objects; time and temporalities; material and technology; culture, landscape, and geopolitics. The OCCAS seminar Images of Egypt has been taught by professors Tim Anstey and Mari Lending, and the exhibition is made with Eirik Arff Gulseth Bøhn, Beata Labuhn, Kosha Ahmadi, Mikala Kjær, Eirik Stokke, Eva Storrusten, Robert Sømod, and Xianwen Zheng. Originally posted Apr 27, 2017.